If you go out into your garden or into a forest or a park and start digging, you will find that the soil is moist (unless you’re in a desert), but it’s not saturated with water. This means that some of the pore space in the soil is occupied by water, and some of the pore space is occupied by air (unless you’re in a swamp). This is known as the unsaturated zone. If you could dig down far enough, you would get to the point where all of the pore spaces are 100% filled with water (saturated) and the bottom of your hole would fill up with water. The level of water in the hole represents the water table, which is the surface of the saturated zone. In most parts of British Columbia, the water table is several metres below the surface. Water falling on the ground surface as precipitation (rain, snow, hail, fog, etc.) may flow off a hill slope directly to a stream in the form of runoff, or it may infiltrate the ground, where it is stored in the unsaturated zone. The water in the unsaturated zone may be used by plants (transpiration), evaporate from the soil (evaporation), or continue past the root zone and flow downward to the water table, where it recharges the groundwater. A cross-section of a typical hillside with an unconfined aquifer is illustrated in Figure 14.5. In areas with topographic relief, the water table generally follows the land surface, but tends to come closer to surface in valleys, and intersects the surface where there are streams or lakes. The water table can be determined from the depth of water in a well that isn’t being pumped, although, as described below, that only applies if the well is within an unconfined aquifer. In this case, most of the hillside forms the recharge area, where water from precipitation flows downward through the unsaturated zone to reach the water table. The area at the stream or lake to which the groundwater is flowing is a discharge area. What makes water flow from the recharge areas to the discharge areas? Recall that water is flowing in pores where there is friction, which means it takes work to move the water. There is also some friction between water molecules themselves, which is determined by the viscosity. Water has a low viscosity, but friction is still a factor. All flowing fluids are always losing energy to friction with their surroundings. Water will flow from areas with high energy to those with low energy. Recharge areas are at higher elevations, where the water has high gravitational energy. It was energy from the sun that evaporated the water into the atmosphere and lifted it up to the recharge area. The water loses this gravitational energy as it flows from the recharge area to the discharge area. In Figure 14.5, the water table is sloping; that slope represents the change in gravitational potential energy of the water at the water table. The water table is higher under the recharge area (90 m) and lower at the discharge area (82 m). Imagine how much work it would be to lift water 8 m high in the air. That is the energy that was lost to friction as the groundwater flowed from the top of the hill to the stream. The situation gets a lot more complicated in the case of confined aquifers, but they are important sources of water so we need to understand how they work. As shown in Figure 14.6, there is always a water table, and that applies even if the geological materials at the surface have very low permeability. Where there is a confined aquifer — meaning one that is separated from the surface by a confining layer — this aquifer will have its own “water table,” which is actually called a potentiometric surface, as it is a measure of the total potential energy of the water. The red dashed line in Figure 14.6 is the potentiometric surface for the confined aquifer, and it describes the total energy that water is under within the confined aquifer. If we drill a well into the unconfined aquifer, the water will rise to the level of the water table (well A in Figure 14.6). But if we drill a well through both the unconfined aquifer and the confining layer and into the confined aquifer, the water will rise above the top of the confined aquifer to the level of its potentiometric surface (well B in Figure 14.6). This is known as an artesian well, because the water rises above the top of the aquifer. In some situations, the potentiometric surface may be above the ground level. The water in a well drilled into the confined aquifer in this situation would rise above ground level, and flow out, if it’s not capped (well C in Figure 14.6). This is known as a flowing artesian well. In situations where there is an aquitard of limited extent, it is possible for a perched aquifer to exist as shown in Figure 14.7. Although perched aquifers may be good water sources at some times of the year, they tend to be relatively thin and small, and so can easily be depleted with over-pumping. (where V is the velocity of the groundwater flow, K is the hydraulic conductivity, and i is the hydraulic gradient). We can apply this equation to the scenario in Figure 14.5. If we assume that the permeability is 0.00001 m/s we get: V = 0.00001 * 0.08 = 0.0000008 m/s. That is equivalent to 0.000048 m/min, 0.0029 m/hour or 0.069 m/day. That means it would take 1,450 days (nearly four years) for water to travel the 100 m from the vicinity of the well to the stream. Groundwater moves slowly, and that is a reasonable amount of time for water to move that distance. In fact it would likely take longer than that, because it doesn’t travel in a straight line. Exercise 14.1 How Long Will It Take? Sue, the owner of Joe’s 24-Hour Gas, has discovered that her underground storage tank (UST) is leaking fuel. She calls in a hydrogeologist to find out how long it might take for the fuel contamination to reach the nearest stream. 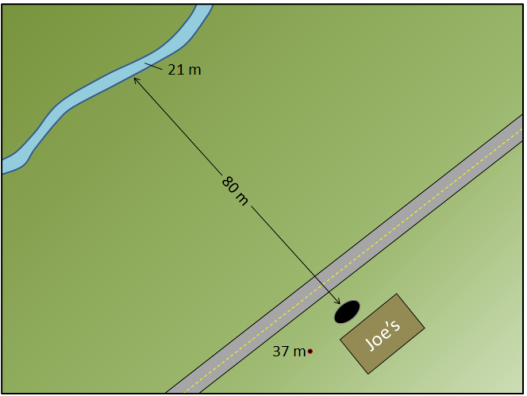 They discover that the well at Joe’s has a water level that is 37 m above sea level and the elevation of the stream is 21 m above sea level. The sandy sediment in this area has a permeability of 0.0002 m/s. It’s critical to understand that groundwater does not flow in underground streams, nor does it form underground lakes. With the exception of karst areas, with caves in limestone, groundwater flows very slowly through granular sediments, or through solid rock that has fractures in it. Flow velocities of several centimetres per day are possible in significantly permeable sediments with significant hydraulic gradients. But in many cases, permeabilities are lower than the ones we’ve used as examples here, and in many areas, gradients are much lower. It is not uncommon for groundwater to flow at velocities of a few millimetres to a few centimetres per year. As already noted, groundwater does not flow in straight lines. It flows from areas of higher hydraulic head to areas of lower hydraulic head, and this means that it can flow “uphill” in many situations. This is illustrated in Figure 14.8. The dashed orange lines are equipotential, meaning lines of equal pressure. The blue lines are the predicted groundwater flow paths. The dashed lines red lines are no-flow boundaries, meaning that water cannot flow across these lines. That’s not because there is something there to stop it, but because there’s no pressure gradient that will cause water to flow in that direction. Groundwater flows at right angles to the equipotential lines in the same way that water flowing down a slope would flow at right angles to the contour lines. The stream in this scenario is the location with the lowest hydraulic potential, so the groundwater that flows to the lower parts of the aquifer has to flow upward to reach this location. It is forced upward by the pressure differences, for example, the difference between the 112 and 110 equipotential lines. Groundwater that flows through caves, including those in karst areas — where caves have been formed in limestone because of dissolution — behaves differently from groundwater in other situations. Caves above the water table are air-filled conduits, and the water that flows within these conduits is not under pressure; it responds only to gravity. In other words, it flows downhill along the gradient of the cave floor (Figure 14.9). Many limestone caves also extend below the water table and into the saturated zone. Here water behaves in a similar way to any other groundwater, and it flows according to the hydraulic gradient and Darcy’s law. 14.2 Groundwater Flow by Steven Earle is licensed under a Creative Commons Attribution 4.0 International License, except where otherwise noted.